April 9, 2014 – The Dressage Foundation is pleased to announce that Alexandra du Celliee Muller from Little Rock, AR, is the 2014 recipient of the $500 Trip Harting Grant. Alexandra plans to use the funds to continue her education in the United States Dressage Federation Instructor Certification Program. 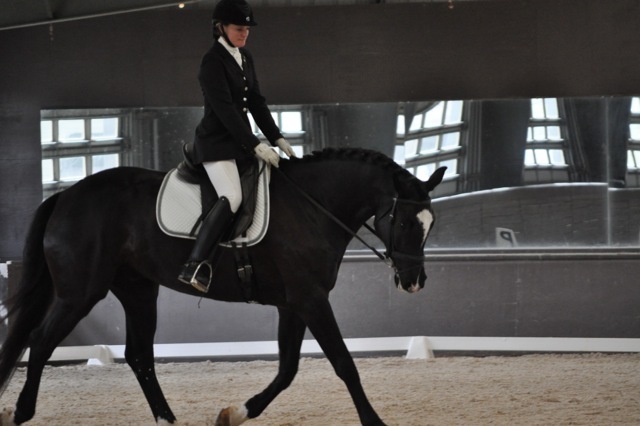 Alexandra has been a member of Pony Club since 1995 and received her Dressage A rating in 2012. Throughout her time in Pony Club, Alexandra has volunteered for the Santa Barbara Chapter of California Dressage Society and taught at her own Club and others, giving ratings, teaching horse management and judging at rallies. Alexandra says, “I am thrilled to have been chosen for the Trip Harting Fund Grant. Thank you to The Dressage Foundation for creating this fabulous grant and for selecting me as this year’s recipient. My goal is to become a certified instructor so that my students, my community and I can all be confident that I am teaching according to classical dressage principles. I am also aiming to transition from a USPC Apprentice National Examiner to a full-fledged National Examiner within the next year or so. As I focus on these educational-oriented goals, I also plan to continue working with my own horses with the goal of bringing them up the levels and keeping them willing and happy in their work, both at home and in competition." Trip's friends, students, and admirers established this Fund at The Dressage Foundation in his memory. Trip, a beloved judge, coach and clinician, passed away in August 2008. The purpose of the Fund is to provide financial assistance for a Pony Club rider to attend the USDF 'L' Education Program or Instructor Certification Program. Applicants must be current or graduate Pony Club members with a B or A rating. The Trip Harting Fund will continue to grow over time as new donations flow into The Dressage Foundation. The Foundation will continue to award grants based on recommendations of the Selection Committee for as long as the Fund balance allows. Applications are due to the Foundation in March of each year.